I wanted to take a moment here on my little corner of the internet to share one of my favourite recipes with you. I call it Salsamole. Salsamole came about by accident one day when I was planning on making guacamole but didn't mash the avocado before adding in the tomatoes, onions, garlic, and jalapeño pepper. The result was unmashed avocado pieces with finely diced pieces of everything else. And it was fantastic. 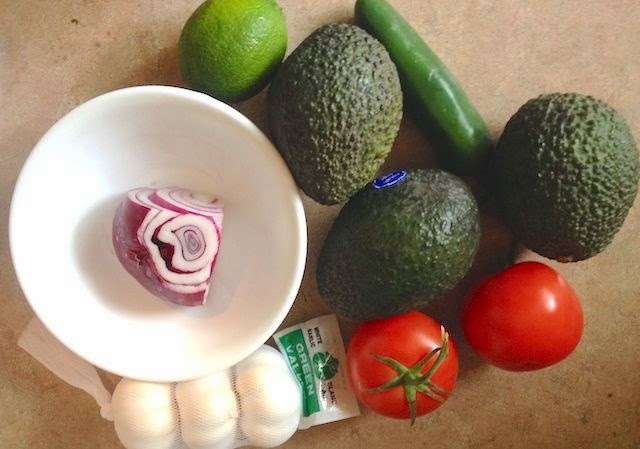 I still haven't made my regular guacamole recipe since (which is pretty fantastic already, if I do say so myself). This could really be done with any guacamole recipe that calls for pieces of other produce, but my recipe is actually from a random man in the international foods aisle at the Atlantic Superstore on Barrington in Halifax during the summer that I lived there. I was grocery shopping for my house with one of my housemates and we were searching for a guacamole powder that one girl told us existed and she wanted for the night that it was her turn to make supper. We were having absolutely no luck. Neither of us had ever heard of a guacamole powder before and the idea wasn't appetizing, but we searched nonetheless. In our third or fourth turn about the aisle, a man overhead us and cut in saying, "Oh no! You cannot make guacamole from powder, even if you do find it!" He then proceeded to tell us that he owns a Mexican restaurant and gave us the recipe that they use daily. 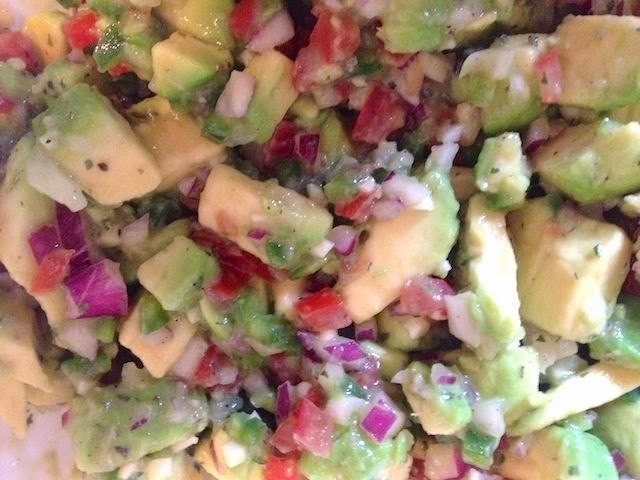 I've tweaked it since then, but his simple instructions have always stuck with me: 3-4 avocados, one tomato, half a red onion, a small jalapeño pepper (insides scraped out), salt, and cilantro. That's it. And it was delicious. My guacamole has since changed to include garlic (I love it, I do), pepper, cayenne pepper when I do not have a jalapeño pepper, a lime to keep the avocado green, and I scrape the insides of the tomato out too, so that it doesn't get so juicy. 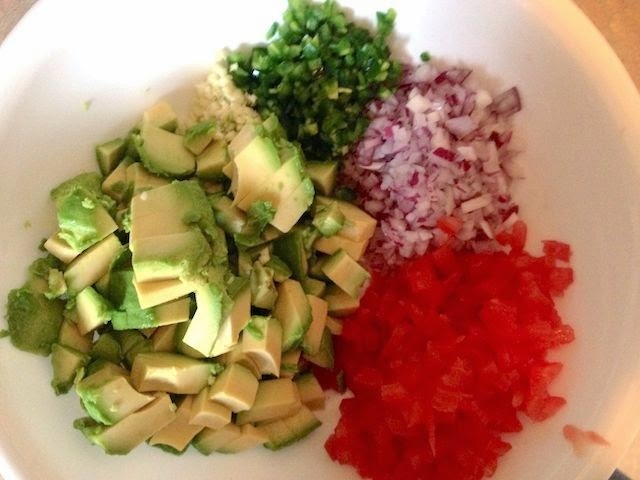 Keep on reading so you too can make yourself some Salsamole or guacamole - Sweet Spontaneity style. Cut your tomatoes in half, remove juices and seeds, then dice them. When I am making guacamole I like to dice everything super fine, but any size will do for Salsamole. The chunkier the better, at times. Add to bowl. Dice your red onion. The amount of onion can definitely be altered. I used to only use about 1/4 of an onion, and it was still super delicious. It's really all about personal preference here. My above comment about dicing still applies here, but sometimes it's nicer to keep onion pieces smaller, especially since it's raw. Add to bowl. Cut your lime in half and squeeze the juice from both sides into the bowl. Add your form of garlic. Add your jalapeño pepper (insides removed and diced) OR cayenne pepper. You definitely do not need both. Add cilantro, salt, and pepper. I skipped the salt last time and didn't notice, but some people swear by it. Mix it up and serve with your choice of chips, crackers, or bread. I typically use pita chips or corn chips. I really like bringing this dish to get-togethers or to share at work. I also like using it as an appetizer while cooking supper with my roommate so we don't get too hungry on the nights we have to wait until later to start cooking. This would also be great to serve as a side dish for tacos, burritos, quesadillas, or any other Mexican-inspired dishes. Please let me know if you give this recipe a try! What is one of your favourite recipes to serve as an appetizer or snack? So colorful! It looks and sounds delicious! Ooh this sounds so good. I also love sliced avocado with a little olive oil and sea salt on crostini!! I've definitely been missing salsa and Mexican food in Italy.